One day late last year, Katrina Sutton stood at a gas pump outside Atlanta and swiped her debit card. Insufficient funds. But that couldn't be. She'd been careful to wait until her $270 paycheck from Walmart had hit her account. The money wasn't there? It was all she had. And without gas, she couldn't get to work. She tried not to panic, but after she called her card company, she couldn't help it. Her funds had been frozen, she was told, by World Finance. World is one of America's largest providers of installment loans, an industry that thrives in at least 19 states, mostly in the South and Midwest; claims more than 10 million customers; and has survived recent efforts by lawmakers to curtail lending that carries exorbitant interest rates and fees. Installment lenders were not included in a 2006 federal law that banned selling some classes of loans with an annual percentage rate above 36 percent to service members — so the companies often set up shop near the gates of military bases, offering loans with annual rates that can soar into the triple digits. Installment loans have been around for decades. While payday loans are usually due in a matter of weeks, installment loans get paid back in installments over time — a few months to a few years. Both types of loans are marketed to the same low-income consumers, and both can trap borrowers in a cycle of recurring, expensive loans. Installment loans can be deceptively expensive. World and its competitors push customers to renew their loans over and over again, transforming what the industry touts as a safe, responsible way to pay down debt into a kind of credit card with sky-high annual rates, sometimes more than 200 percent. And when state laws force the companies to charge lower rates, they often sell borrowers unnecessary insurance products that rarely provide any benefit to the consumer but can effectively double the loan's annual percentage rate. Former World employees say they were instructed not to tell customers the insurance is voluntary. When borrowers fall behind on payments, calls to the customer's home and workplace, as well as to friends and relatives, are routine. Next come home visits. And as Sutton and many others have discovered, World's threats to sue its customers are often real. The Consumer Financial Protection Bureau, the new federal agency charged with overseeing consumer-finance products and services, has the power to sue nonbank lenders for violating federal laws. It could also make larger installment lenders subject to regular examinations, but it hasn't yet done so. Installment companies have supported Republican efforts to weaken the agency, echoing concerns raised by the lending industry as a whole. The CFPB declined to comment on any potential rule-making or enforcement action. Despite a customer base that might best be described as sub-subprime, World comfortably survived the financial crisis. Its stock, which trades on the Nasdaq under the company's corporate name, World Acceptance Corp., has nearly tripled in price in the last three years. The company services more than 800,000 customers at upward of 1,000 offices in 13 states. It also extends into Mexico, where it has about 120,000 customers. In a written response to questions for this story, World argued that the company provides a valuable service for customers who might not otherwise qualify for credit. The loans are carefully underwritten to be affordable for borrowers, the company said, and since the loans involve set monthly payments, they come with a "built-in financial discipline." The company denied that it deceives customers, saying that it trains its employees to tell borrowers that insurance products are voluntary and that it also informs customers of this in writing. It said it contacts delinquent borrowers at their workplace only after it has failed to reach them at their homes and that it resorts to lawsuits to recoup delinquent payments in accordance with state laws. "World values its customers," the company wrote, "and its customers demonstrate by their repeat business that they value the service and products that World offers." 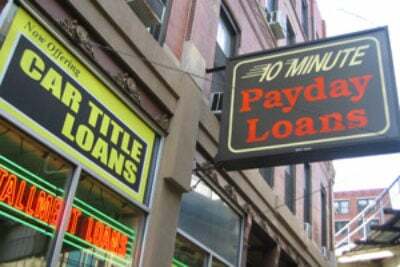 The installment industry promotes its products as a consumer-friendly alternative to payday loans. Installment loans are "the safest form of consumer credit out there," said Bill Himpler, the executive vice president of the American Financial Services Association, of which World and other major installment lenders are members. About 5 percent of World's customers, approximately 40,000, are service members or their families, the company said. According to the Defense Department, active-duty military personnel and their dependents comprise about 1 percent of the U.S. population. Back in August 2009, Sutton's 1997 Crown Victoria needed fixing, and she was "between paychecks," as she put it. Some months, more than half of her paycheck went to student-loan bills stemming from her pursuit of an associate degree at the University of Phoenix. Living with her mother and grandparents saved on rent, but her part-time job as a Walmart cashier didn't provide much leeway. She was short that month and needed her car to get to work. She said she happened to pass by a World Finance storefront in a strip mall in McDonough, Ga. A neon sign advertised "LOANS," and mirrored windows assured privacy. She went inside. 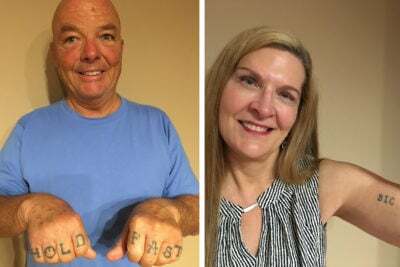 A credit check showed "my FICO score was 500-something," Sutton remembered, putting her creditworthiness in the bottom 25 percent of borrowers. "But they didn't have no problem giving me the loan." She walked out with a check for $207. To pay it back, she agreed to make seven monthly payments of $50 for a total of $350. The loan papers said the annual percentage rate, which includes interest as well as fees, was 90 percent. Sutton had received what World employees call a "starter loan." That's something Paige Buys learned after she was hired to work at a World Finance branch in Chandler, Okla., at the age of 18. At that point, she only had a dim notion of what World did. At 19, she was named branch manager (the youngest in company history, she remembered being told), and by then she had learned a lot. And the more she understood, the more conflicted she felt. "I hated the business," she said. "I hated what we were doing to people. But I couldn't just quit." The storefront, which lies on the town's main artery, Route 66, is very much like the one where Sutton got her loan. Behind darkened windows sit a couple of desks and a fake tree. The walls are nearly bare. Typical of World storefronts, it resembles an accountant's office more than a payday loan store. Buys said any prospective borrower was virtually guaranteed to qualify for a loan of at least $200. Low credit scores are common, she and other former employees said, but World teaches its employees to home in on something else: whether at least some small portion of the borrower's monthly income isn't already being consumed by other debts. If, after accounting for bills and some nominal living expenses, a customer still has money left over, World will take them on. In its written response, World said the purpose of its underwriting procedures was to ensure that the borrower has enough income to make the required payments. With few exceptions, World requires its customers to pledge personal possessions as collateral that the company can seize if they don't pay. The riskier the client, the more items they were required to list, former employees say. Sutton offered two of her family's televisions, a DVD player, a PlayStation and a computer. Together, they amounted to $1,600 in value, according to her contract. In addition, World listed her car. There are limits to what World and other lenders can ask borrowers to pledge. Rules issued in 1984 by the Federal Trade Commission put "household goods" such as appliances, furniture and clothing off limits — no borrower can be asked to literally offer the shirt off his back. One television and one radio are also protected, among other items. But the rules are so old, they make no mention of computers. Video game systems, jewelry, chainsaws, firearms — these are among the items listed on World's standard collateral form. The contracts warn in several places that World has the right to seize the possessions if the borrower defaults. "They started threatening me," a World customer from Brunswick, Ga., said. "If I didn't make two payments, they would back a truck up and take my furniture, my lawn mower." (In fact, furniture is among the items protected under the FTC rule.) The woman, who asked to remain anonymous because she feared the company's employees, was most upset by the prospect of the company taking her piano. She filed for bankruptcy protection last year. In fact, former World employees said, it was exceedingly rare for the company to actually repossess personal items. "Then you've got a broken-down Xbox, and what are you going to do with it?" asked Kristin, who worked in a World branch in Texas in 2012 and, from fear of retaliation, asked that her last name not be used. World supervisors "would tell us, 'You know, we are never going to repossess this stuff' — unless it was a car," Buys said. World acknowledged in its response that such repossessions are rare, but it said the collateral played a valuable role in motivating borrowers. "World believes that an important element of consumer protection is for a borrower to have an investment in the success of the transaction," the company wrote. When "borrowers have little or no investment in the success of the credit transaction they frequently find it easier to abandon the transaction than to fulfill their commitments." Sutton's loan contract said her annual percentage rate, or APR, was 90 percent. It wasn't. Her effective rate was more than double that: 182 percent. World can legally understate the true cost of credit because of loopholes in federal law that allow lenders to package nearly useless insurance products with their loans and omit their cost when calculating the annual rate. As part of her loan, Sutton purchased credit life insurance, credit disability insurance, automobile insurance and non-recording insurance. She, like other borrowers ProPublica interviewed, cannot tell you what any of them are for: "They talk so fast when you get that loan. They go right through it, real gibberish." The insurance products protect World, not the borrower. If Sutton were to have died, become disabled, or totaled her car, the insurer would have owed World the unpaid portion of her loan. Together, the premiums for her $200 loan total $76, more than the loan's other finance charges. The insurance products provide a way for World to get around the rate caps in some states and effectively to charge higher rates. Sutton's stated annual percentage rate of 90 percent, for example, is close to the maximum that can legally be charged in Georgia. ProPublica examined more than 100 of the company's loans in 10 states, all made within the last several years. A clear pattern developed: In states that allowed high rates, World simply charged high interest and other finance fees but did not bother to include insurance products. 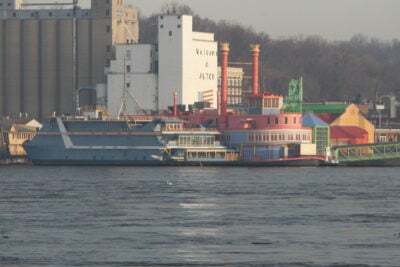 For a small loan like Sutton's, for example, World has charged a 204 percent annual rate in Missouri and 140 percent in Alabama, states that allow such high levels. In states with more stringent caps, World slapped on the insurance products. The stated annual rate was lower, but when the insurance premiums were accounted for, the loans were often even more expensive than those in the high-rate states. "Every new person who came in, we always hit and maximized with the insurance," said Matthew Thacker, who worked as an assistant manager at a World branch in Tifton, Ga., from 2006 to 2007. "That was money that went back to the company." World profits from the insurance in two ways: It receives a commission from the insurer, and, since the premium is typically financed as part of the loan, World charges interest on it. "The consumer is screwed six ways to Sunday," said Birny Birnbaum, the executive director of the nonprofit Center for Economic Justice and a former associate commissioner at the Texas Department of Insurance. Industry data reveal just how profitable this part of World's business is. World offers the products of an insurer called Life of the South, a subsidiary of the publicly traded Fortegra Financial Corp. In Georgia in 2011, the insurer received $26 million in premiums for the sort of auto insurance Sutton purchased as part of her loan. Eighteen million dollars, or 69 percent, of that sum went right back to lenders like World. In all, remarkably little money went to pay actual insurance claims: about 5 percent. The data, provided to ProPublica by the National Association of Insurance Commissioners, paint a similar picture when it comes to Life of the South's other products. The company's credit accident and health policies racked up $20 million in premiums in Georgia in 2011. While 56 percent went back to lenders, only 14 percent went to claims. The pattern holds in other states where World offers the products. Gretchen Simmons, who managed a World branch in Pine Mountain, Ga., praised the company for offering customers loans they might not have been able to get elsewhere. She said she liked selling accidental death and disability insurance with loans, because many of her clients were laborers who were "more prone to getting their finger chopped off." According to several contracts reviewed by ProPublica, losing one finger isn't enough to make a claim. If the borrower loses a hand, the policy pays a lump sum (for instance, $5,000). But, according to the policy, "loss of a hand means loss from one hand of four entire fingers." Simmons took out a loan for herself from a World competitor — and made sure to decline the insurance. Why? "Because I knew that that premium of a hundred and blah blah blah dollars that they're charging me for it can go right into my pocket if I just deny it." In its written response, World alleged that Simmons had been fired from the company because of "dishonesty and alleged misappropriation of funds," but it refused to provide further details. Simmons, who worked for World from 2005 to 2008, denied that she left the company on bad terms. Federal rules prohibit the financing of credit insurance premiums as part of a mortgage but allow it for installment and other loans. Installment lenders can also legally exclude the premiums when calculating the loan's annual percentage rate, as long as the borrower can select the insurer or the insurance products are voluntary — loopholes in the Truth in Lending Act, the federal law that regulates how consumer-finance products are marketed. World's contracts make all legally necessary disclosures. For example, while some insurance products are voluntary, World requires other types of insurance to obtain a loan. For mandatory insurance, Sutton's contract states that the borrower "may choose the person or company through which insurance is to be obtained." She, like most customers, wouldn't know where to begin to do that, even if it were possible. "Nobody is going to sell you insurance that protects your loan, other than the lender," said Birnbaum. "You can't go down the street to your State Farm agent and get credit insurance." When insurance products are optional — meaning the borrower can deny coverage but still get the loan — borrowers must sign a form saying they understand that. "We were told not to point that out," said Thacker, the former Tifton, Ga., assistant manager. World, in its response to ProPublica, declined to offer any statistics on what percentage of its loans carry the insurance products, but it said employees are trained to inform borrowers that they are voluntary. As for why the company offers the insurance products in some states and not in others, World said it depends on state law and if "it makes business sense to do so." Buys, the former Chandler, Okla., branch manager, said she found the inclusion of the insurance products particularly deceitful. In Oklahoma, World can charge high interest rates and fees on loans under $1,000 or so, so it typically doesn't include insurance on those loans. But it often adds the products to larger loans, which has the effect of jacking up the annual rate. "You were supposed to tell the customer you could not do the loan without them purchasing all of the insurance products, and you never said 'purchase,' " Buys recalled. "You said they are 'included with the loan' and focused on how wonderful they are." It was not long into her tenure that Buys said she began to question whether the products were really required. She asked a family friend who was an attorney if the law required it, she recalled, and he told her it didn't. World trained its employees to think of themselves as a "financial adviser" to their clients, Buys said. She decided to take that literally. When a customer took out a new loan, "I started telling them, 'Hey, you can have this insurance you're never going to use, or you can have the money to spend,'" she recalled. Occasionally, a customer would ask to have the disability insurance included, so she left it in. But mostly, people preferred to take the money. One day, she remembered, she was sitting across from a couple who had come into the office to renew their loan. They were discussing how to cover the costs of a funeral, and Chandler being a small town, she knew it was their son's. On her screen were the various insurance charges from the original loan. The screen "was blinking like I could edit it," she recalled. At that moment, she realized that she could advise customers renewing their loans that they could drop the insurance from their previous loans. If they did so, they'd receive several hundred dollars more. The couple excitedly agreed, she recalled, and other customers also thought it was good advice and dropped the products. Buys' regional supervisor threatened to discipline her, Buys said. But it was hard to punish her for advising customers that the products were voluntary when they were. "All they could do was give me the stink eye," Buys said. But World soon made it harder to remove the insurance premiums, Buys said. She couldn't remove them herself but instead had to submit a form, along with a letter from the customer, to World's central office. That office, she said, sometimes required borrowers to purchase the insurance in order to get the loans. World, in its response to ProPublica's questions, said Buys' assertions about how it handled insurance were "false," but it declined to provide further details. Eventually, Buys said, her relationship with management deteriorated to the point that she felt she had no choice but to quit. By the time she left in 2011, she had worked at World for three years. World, in the answers provided to ProPublica, said that when Buys quit, she was "subject to being terminated for cause including dishonesty and alleged misappropriation of funds." The company declined to provide any details about the allegations, but after Buys quit, World filed suit in county court, accusing her of stealing money from the company. Buys retained an attorney and responded, maintaining her innocence and demanding proof of any theft. World withdrew the suit. Sutton's original loan contract required her to make seven payments of $50, at which point her loan would have been fully paid off. But if World can persuade a customer to renew early in the loan's lifespan, the company reaps the lion's share of the loan's charges while keeping the borrower on the hook for most of what they owed to begin with. This is what makes renewing loans so profitable for World and other installment lenders. "That was the goal, every single time they had money available, to get them to renew, because as soon as they do, you've got another month where they're just paying interest," says Kristin, the former World employee from Texas. Sure enough, less than four months after taking out the initial loan, Sutton agreed to renew. In a basic renewal (the company calls it either a "new loan" or a "refinance"), the borrower agrees to start the loan all over again. For Sutton, that meant another seven months of $50 payments. In exchange, the borrower receives a payout. The amount is based on how much the borrower's payments to date have reduced the loan's principal. For Sutton, that didn't amount to much. She appears to have made three payments on her loan, totaling $150. (The company's accounting is opaque, and Sutton does not have a record of her payments.) But when she renewed the loan, she received only $44. Most of Sutton's payments had gone to cover interest, insurance premiums and other fees, not toward the principal. And when she renewed her loan a second time, it was no different. The effect is similar to how a mortgage amortizes: The portion of each payment that goes toward interest is at its highest the first month and decreases with each payment. As the principal is reduced, less interest is owed each month. By the end of the loan, the payments go almost entirely toward paying down the principal. World regularly sends out mailers, and its employees make frequent phone calls, all to make sure borrowers know they have funds available. Every time a borrower makes a payment, according to the company, that customer "receives a receipt reflecting, among other information, the remaining balance on the borrower's loan and, where applicable, the current new credit available for that borrower." And when a borrower visits a branch to make a payment, former employees say, employees are required to make the pitch in person. "You have to say, 'Let me see what I can do to get you money today,'" Buys recalled. If the borrower had money available on the account, it had to be offered, she and other former employees said. The typical pitch went like this, Kristin said: "'Oh, by the way, you've got $100 available, would you like to take that now or do you want to wait till next month?'" Customers would ask, "'Well, what does this mean?'" Buys said. "And you say, 'Oh, you're just starting your loan over, you know, your payments will be the same.'" The company often encourages customers to renew the loans by saying it will help them repair their credit scores, former employees said, since World reports to the three leading credit bureaus. Successively renewing loans also makes customers eligible for larger loans from World itself. After renewing her loan twice, for instance, Sutton received an extra $40. "We were taught to make [customers] think it was beneficial to them," Buys said. "Retail (i.e., consumer) lending is not significantly unlike other retail operations and, like those other forms of retail, World does market its services," the company wrote in its response to questions. About three-quarters of the company's loans are renewals, according to World's public filings. Customers often renew their loans after only two payments, according to former employees. The company declined to say how many of its renewals occur after two payments or how many times the average borrower renews a loan. Renewals are only granted to borrowers who can be expected to repay the new loan, it said. Lawsuits against other major installment lenders suggest these practices are common in the industry. A 2010 lawsuit in Texas claimed that Security Finance, a lender with about 900 locations in the United States, induced a borrower to renew her loan 16 times over a three-year period. The suit was settled. In 2004, an Oklahoma jury awarded a mentally disabled Security Finance borrower $1.8 million; he had renewed two loans a total of 37 times. After the company successfully appealed the amount of damages, the case was settled. Security Finance declined to respond to questions about the suits. Another 2010 suit against Sun Loan, a lender with more than 270 office locations, claims the company convinced a husband and wife to renew their loans more than two dozen times each over a five-year period. Cary Barton, an attorney representing the company in the suit, said renewals occur at the customer's request, often because he or she doesn't have enough money to make the monthly payment on the previous loan. The predominance of renewals means that for many of World's customers, the annual percentage rates on the loan contracts don't remotely capture the real costs. If a borrower takes out a 12-month loan for $700 at an 89 percent annual rate, for example, but repeatedly renews the loan after four payments of $90, he would receive a payout of $155 with each renewal. In effect, he is borrowing $155 over and over again. And for each of those loans, the effective annual rate isn't 89 percent. It's 537 percent. World called this calculation "completely erroneous," largely because it fails to account for the money the customer received from the original transaction. World's calculation of the annual percentage rate if a borrower followed this pattern of renewals for three years: about 110 percent. In every World office, employees say, there were loan files that had grown inches thick after dozens of renewals. At not just one but two World branches, Emma Johnson of Kennesaw, Ga., was that customer. Her case demonstrates how immensely profitable borrowers like her are for the company — and how the renewal strategy can transform long-term, lower-rate loans into short-term loans with the triple-digit annual rates of World's payday competitors. Since being laid off from her janitorial job in 2004, Johnson, 71, has lived primarily on Social Security. Last year, that amounted to $1,139 in income per month, plus a housing voucher and food stamps. Johnson could not remember when she first obtained a loan from World. Nor could she remember why she needed either of the loans. She can tell you, however, the names of the branch managers (Charles, Brittany, Robin) who've come and gone over the years, her loans still on the books. Johnson took out her first loan from World in 1993, the company said. Since that time, she has taken out 48 loans, counting both new loans and refinancings, from one branch. In 2001, she took out a loan from the second branch and began a similar string of renewals. When Johnson finally declared bankruptcy early this year, her two outstanding loans had face values of $3,510 and $2,970. She had renewed each loan at least 20 times, according to her credit reports. Over the last 10 years, she had made at least $21,000 in payments toward those two loans, and likely several thousand dollars more, according to a ProPublica analysis based on her credit reports and loan documents. Although the stated length of each loan was about two years, Johnson would renew each loan, on average, about every five months. The reasons varied, she said. "Sometimes stuff would just pop out of the blue," she said. This or that needed a repair, one of her children would need money. Sometimes, it was just too enticing to get that extra few hundred dollars, she acknowledged. "In a sense, I think I was addicted." It typically took only a few minutes to renew the loan, she said. The contract contained pages of disclosures and fine print, and the World employee would flip through, telling her to sign here, here and here, she recalled. Her loan contracts from recent years show that the payouts were small, often around $200. That wasn't much more than the $115 to $135 Johnson was paying each month on each loan. The contracts had stated APRs ranging from about 23 percent to 46 percent. But in reality, because Johnson's payments were largely going to interest and other fees, she was taking out small loans with annual rates typically in the triple digits, ranging to more than 800 percent. World also disputed this calculation. As she continued to pay, World would sometimes increase her balance, providing her a larger payout, but her monthly payment grew as well. It got harder and harder to make it from one Social Security check to the next. 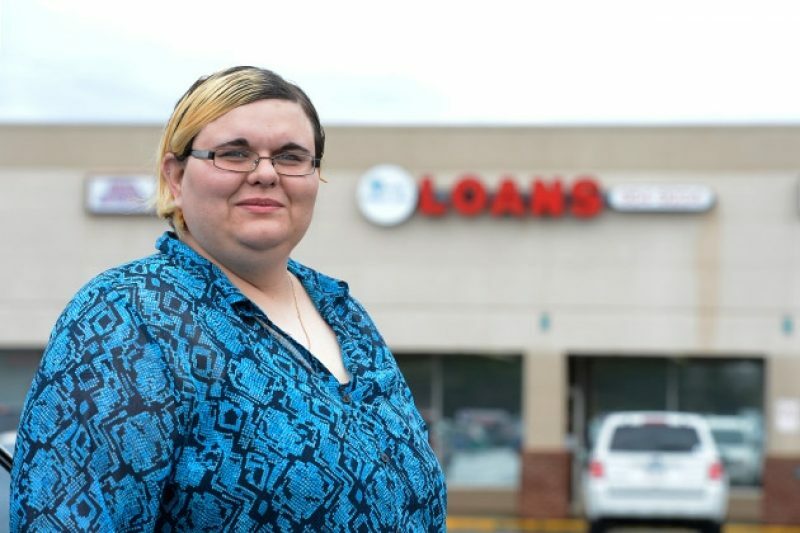 In 2010, she took out another loan, this one from an auto-title lender unconnected to World. Eventually, she gave up on juggling the three loans. By the end of each month, she was out of money. If she had to decide between basic necessities like gas and food and paying the loans, the choice, she finally realized, was easy. At World, a normal month begins with about 30 percent of customers late on their payments, former employees recalled. Some customers were habitually late because they relied on Social Security or pension checks that came later in the month. They might get hit with a late fee of $10 to $20, but they were otherwise reliable. Others required active attention. Phone calls are the first resort, and they begin immediately — sometimes even before the payment is due for customers who were frequently delinquent. When repeated calls to the home or cell phone, often several times a day, don't produce a payment, World's employees start calling the borrower at work. Next come calls to friends and family, or whomever the borrower put down as the seven "references" required as part of the loan application. "We called the references on a daily basis to the point where they got sick of us," said Simmons, who managed the Pine Mountain, Ga., store. If the phone calls don't work, the next step is to visit the customer at home: "chasing," in the company lingo. "If somebody hung up on us, we would go chase their house," said Kristin from Texas. The experience can be intimidating for customers, especially when coupled with threats to seize their possessions, but the former employees said they dreaded it, too. "That was the scariest part," recalled Thacker, a former Marine, who as part of his job at World often found himself driving, in the evening, deep into the Georgia countryside to knock on a borrower's door. He was threatened a number of times, he said, once with a baseball bat. Visits to the borrower's workplace are also common. The visits and calls at work often continue even after borrowers ask the company to stop, according to complaints from World customers to the Federal Trade Commission. Some borrowers complained the company's harassment risked getting them fired. ProPublica obtained the FTC complaints for World and several other installment loan companies through a Freedom of Information Act request. They show consistent tactics across the industry: the repeated phone calls, the personal visits. After she stopped paying, Johnson remembered, World employees called her two to three times a day. One employee threatened to "get some stuff at your house," she said, but she wasn't cowed. "I said, 'You guys can get this stuff if you want it.'" In addition, a World employee knocked on her door at least three times, she said. The goal of the calls and visits, former employees said, is only partly to prod the customer to make a payment. Frequently, it's also to persuade them to renew the loan. "That's [World's] favorite phrase: 'Pay and renew, pay and renew, pay and renew,'" Simmons said. "It was drilled into us." It's a tempting offer: Instead of just scrambling for the money to make that month's payment, the borrower gets some money back. And the renewal pushes the loan's next due date 30 days into the future, buying time. But the payouts for these renewals are often small, sometimes minuscule. In two of the contracts ProPublica examined, the customer agreed to start the loan all over again in exchange for no money at all. At other times, payouts were as low as $1, even when, as in one instance, the new loan's balance was more than $3,000. For Sutton, making her monthly payments was always a struggle. She remembered that when she called World to let them know she was going to be late with a payment, they insisted that she come in and renew the loan instead. As a result, seven months after getting the original $207 loan from World, Sutton wasn't making her final payment. Instead, she was renewing the loan for the second time. Altogether, she had borrowed $336, made $300 in payments, and now owed another $390. She was going backward. Not long after that second renewal, Sutton said, Walmart reduced her hours, and there simply wasn't enough money to go around. "I called them at the time to say I didn't have money to pay them," she said. World told her she had to pay. The phone calls and home visits followed. A World employee visited the Walmart store where she worked three times, she recalled. World didn't dispute that its employees came to Sutton's workplace, but it said that attempts to contact "any borrower at her place of employment would occur only after attempts to contact the borrower at her residence had failed." In Georgia, World had another path to force Sutton to pay: suing her. 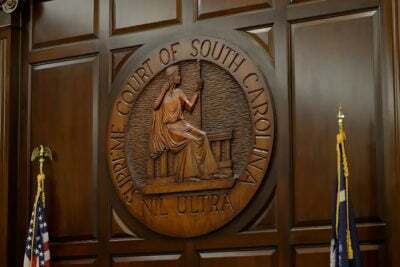 World files thousands of such suits each year in Georgia and other states, according to a review of court filings, but the company declined to provide precise figures. Because Sutton had a job, she was a prime target for a suit. Social Security income is off limits, but with a court judgment, a creditor can garnish up to 25 percent of a debtor's wages in Georgia. "When we got to sue somebody, [World] saw that as the jackpot," Buys said. In her Oklahoma store, collecting the junk people had pledged as collateral was considered useless. Garnishment was a more reliable way for the company to get its money, and any legal fees were the borrower's problem. World said 11 of the states where it operates permit lenders to "garnish customers' wages for repayment of loans, but the Company does not otherwise generally resort to litigation for collection purposes, and rarely attempts to foreclose on collateral." The sheriff served Sutton with a summons at Walmart, in front of her co-workers. Sutton responded with a written note to the court, saying she would pay but could only afford $20 per month. A court date was set, and when she appeared, she was greeted by the branch manager who had given her the original loan. The manager demanded Sutton pay $25 every two weeks. She agreed. For five months, Sutton kept up the payments. Then, because of taxes she had failed to pay years earlier, she said, the IRS seized a portion of her paycheck. Again, she stopped paying World. In response, the company filed to garnish her wages, but World received nothing: Sutton was earning too little for the company to legally get a slice of her pay. After two months, World took another step. Sutton's wages are paid via a "payroll card," a kind of debit card provided by Walmart. World filed to seize from Sutton's card the $450 it claimed she owed. By that point, she'd made more than $600 in payments to the company. The immediate result of the action was to freeze Sutton's account, her only source of income. She couldn't gas up her car. As a result, she couldn't drive to work. Sutton said she called a number for World's corporate office in a panic. "I said, 'You're gonna leave me with no money to live on?'" The World employee said the company had had no choice because Sutton didn't hold up her end of their agreement, Sutton recalled, and then the employee made an offer: If Sutton's available wages in her account hadn't covered her total debt to World after 30 days, the company would unfreeze her account and allow her to start a new payment plan. Desperate, she gave up trying to deal with the company on her own and went to Georgia Legal Services Program, a nonprofit that represents low-income clients across the state. "Her case is terribly egregious," said Michael Tafelski, a lawyer with GLSP who specializes in collections cases and represented Sutton. World had overstated the amount Sutton legally owed, he said, and circumvented laws limiting the amount of funds creditors can seize. In effect, the company was garnishing 100 percent of her wages. It's "unlike anything I have ever seen," Tafelski said, "and I have seen a lot of shady collectors." After Tafelski threatened to sue World, the company beat a quick retreat. It dismissed all open cases against Sutton and declared her obligation satisfied. In its response to ProPublica, World claimed that Tafelski had bullied the billion-dollar company: "Mr. Tafelski used abusive out of court threats to accomplish an end he knew he could not obtain through legal process." "It's common practice among lawyers to contact the opposing party to attempt to resolve problems quickly, without filing a lawsuit, especially in emergency cases like this one," Tafelski said. As for Sutton, she had missed several days of work, but her account was unfrozen, and she was done with World Finance forever. "If I'd known then what I know now," she said, "I'd never have fooled with them."